Definition at line 43 of file lleventinfo.h. Definition at line 69 of file lleventinfo.h. Definition at line 46 of file lleventinfo.h. Definition at line 41 of file lleventinfo.cpp. References gPacificDaylightTime, llformat(), mTimeStr, S32, tut::tm(), and utc_to_pacific_time(). Definition at line 126 of file lleventinfo.cpp. Definition at line 70 of file lleventinfo.cpp. References FALSE, LLMessageSystem::getString(), LLMessageSystem::getU32(), LLMessageSystem::getVector3d(), mCategoryStr, mCover, mDesc, mDuration, mEventFlags, mHasCover, mID, mName, mPosGlobal, mRunByID, mSimName, mTimeStr, mUnixTime, and TRUE. Definition at line 57 of file lleventinfo.h. Definition at line 65 of file lleventinfo.h. Definition at line 56 of file lleventinfo.h. Definition at line 58 of file lleventinfo.h. Definition at line 66 of file lleventinfo.h. Definition at line 64 of file lleventinfo.h. Definition at line 55 of file lleventinfo.h. Referenced by LLEventNotifier::add(), LLEventNotification::load(), and unpack(). Definition at line 54 of file lleventinfo.h. Referenced by LLEventNotification::load(), and unpack(). Definition at line 62 of file lleventinfo.h. Definition at line 60 of file lleventinfo.h. 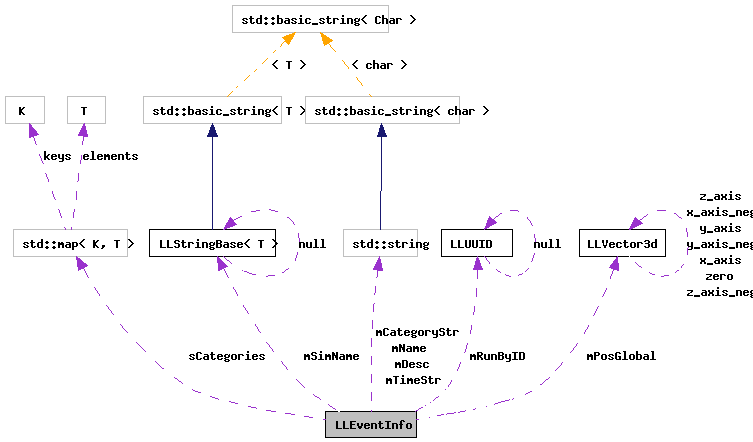 Referenced by LLPanelEvent::draw(), and unpack(). Definition at line 67 of file lleventinfo.h. Definition at line 61 of file lleventinfo.h. Definition at line 59 of file lleventinfo.h. Referenced by LLEventInfo(), LLEventNotification::load(), and unpack(). Definition at line 63 of file lleventinfo.h. Definition at line 70 of file lleventinfo.h.